The words “Italian wine” no doubt conjure images of iconic wines like Barolo, Brunello, Chianti and so forth, and rightly so. However, as temperatures (slowly) climb and summer approaches, the best thing coming out of Italy may well be the rich, mineral soaked, delicious white wines made from all sorts of grapes you simply won’t find anywhere else. Don’t let the unknown names deter you — there is great delight to be had in all these indigenous varieties, which is exactly what we found in New York at the Snooth People’s Voice Awards Wine Writers Seminar on the white wines of Italy. Finding delight in indigenous Italian whites! 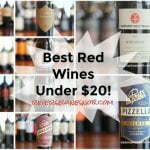 And so today we turn to these excellent Italian whites and as is our custom, I’ve also included reviews of two of my favorites under $20, which just so happen to both be Bulk Buys! Italy has more indigenous grapes than any other country in the world, and it shows in their white wines. There are the better known, although perhaps still a bit under radar, varieties like Friulianowhich is pretty much exclusively grown in the Friuli-Venezia Giulia region of Italy, and Trebbiano — “the Chardonnay of Italy”, which is a component of Frascati (as well as other blends). There are also varieties like Gavi, made from the Cortese grape and Soave, which was the highest selling Italian wine region in the U.S. in the 1970’s, made from the Garganega grape. Then there are the lesser known varietals. Take for example, Ribolla Gialla. The wine we tasted, theLuisa Ribolla Gialla was a full-bodied wine that came with a claim to be the rare white that would make a great match with meat (although that’s probably speaks more to this specific wine than the variety). There is also Fiano di Avellino grown in Campania, one of the least fruit driven wines in the world. 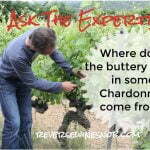 It was a fascinating look into a white wine with very little fruit, and as such, a wine sure to polarize. The wine we tasted, the Terredora di Paolo offered tons of complexity in the glass in the form of spicy mineral and salt notes, but almost no fruit. We also discovered wines like Pigato from the Riviera Ligure di Ponente DOC, an area on the coast between France and Tuscany. Our guide at the tasting, Giuseppe Capuano from Vias Imports assured us that this is the quintessential variety to pair with pesto. We sampled Kerner from Alto Adige, a variety created in Germany by crossing Schiava (a red grape we covered here) and Riesling. There was also Nosiola, a lighter-bodied white from Trentino andGrillo, a popular white in Sicily. The variety of wines across Italy, which is smaller than the state of California, is simply amazing and we haven’t even mentioned the usual suspects such as Chardonnay, Pinot Grigio/Gris, Pinot Biancoand the like. My two favorite finds of the tasting; however, were a Vermentino from Sardinia and an Orvieto — a blend made up of primarily Grechetto and Trebbiano. 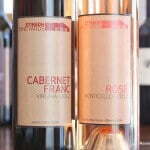 Both of these wines were not only excellent, but different than just about anything else you may have tasted. Let’s find out more! First up is the 2011 Nuraghe Crabioni Vermentino di Sardegna, a 100% Vermentino from Sardinia. This wine has a SRP of $21 but can be found for as low as $14. Sample submitted for review. “Overlooking the Asinara Gulf, Nuraghe Crabioni is a 35 hectare property in the celebrated area of Sorso in Sassari, which is historically renowned for its viticulture. The vineyard benefits from its unique location, enjoying both warm southern winds and cooling maritime breezes. 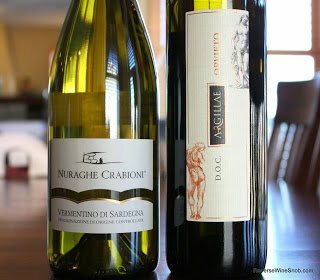 Nuraghe Crabioni wines flaunt a balanced, but distinct character. 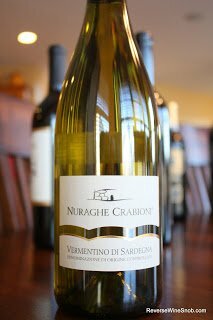 The 2011 Nuraghe Crabioni Vermentino di Sardegna presents quite an intriguing aroma in the glass. You’ll find lemon, almonds, dried herbs, sea salt and mineral notes. The wine tastes…tasty! Good acidity, good balance, salty and spicy mineral notes and a rich and soft texture that is really pleasing to the mouth are just a few of the things you’ll find. Tropical fruit and lemon carries into the finish where a touch of fennel also appears. Fantastic and intriguing, fantastically intriguing, or intriguingly fantastic — take your pick, just do yourself a favor and seek this one out! Second, is the 2011 Argillae Orvieto, a blend of 60% Trebbiano and Grechetto plus 40%Chardonnay, Malvasi di Candia and Sauvignon from Umbria, Italy. This wine has a SRP of $17 and is available for as low as $12. Sample submitted for review. “Orvieto is Umbria’s – and one of Italy’s – most famous white wines. Argillae Orvieto is dry, with a pleasant complexity of aromas, citrus, tropical fruits and floral scents. It pairs beautifully with hors d’oeuvres, salads, pasta with seafood or vegetables and light second courses. The 2011 Argillae Orvieto begins with aromas of citrus, delicate floral notes and a hint of tropical fruit. The wine tastes very fresh, rich and flavorful in the mouth. This is another really tasty one, although don’t drink it too cold to really enjoy it. There are even a few hints of nuts and a light spicy minerality that comes out on the excellent finish. Easy to drink and delicious!